Webster volunteered for the 101st Airborne in the US Army during WWII, jumping into Normandy, France on D-Day, and again into Holland during Operation Market Garden. 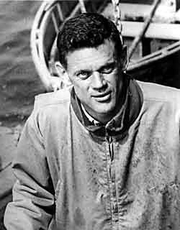 After the war, he served as a reporter for the Wall Street Journal and Los Angeles Daily News, took an interest in oceanography and sharks, and was lost at sea, presumed dead, in 1961. David Kenyon Webster is currently considered a "single author." If one or more works are by a distinct, homonymous authors, go ahead and split the author. David Kenyon Webster is composed of 1 name.